RALPH WILSON/Sun-Gazette Correspondent Bucknell’s Chad Freshnock moves the ball during the Bucknell spring football game Friday in Lewisburg. LEWISBURG — Dave Cecchini’s offense features complex hand signals that look more like some internet dancing fad. His terminology is probably more appropriate for a language arts class. The recently hired Bucknell football coach has a reputation for an offense that eats up yards and blows scoreboard fuses. Cecchini’s offense features the flair of the college game with the complexity of the professional level. 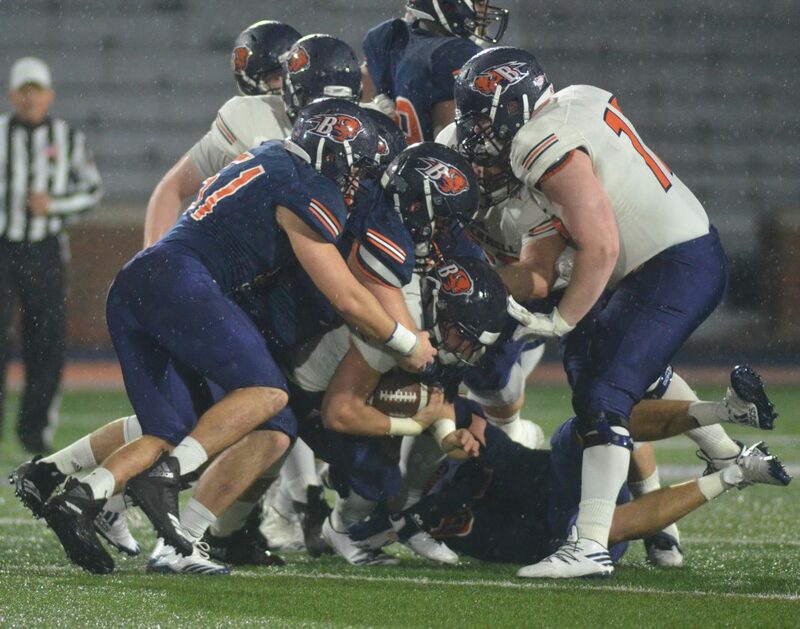 But last night in Bucknell’s rain-soaked spring game at Christy Mathewson Memorial Stadium, the offense looked far from a finished product. With 13 spring practices under its belt, the offense hasn’t had too many reps to work out the kinks in a whole new system with different signals and terminology. Three quarterbacks each had a drive in the first competitive part of the scrimmage, the move-the-ball portion, and never got in field goal range as the defense took the first segment of the scrimmage, 3-0. Quarterbacks Logan Bitikofer, Tarrin Earle and John Chiarolanzio, who all started games last year, each showed flashes of brilliance, but drives were usually finished with overthrows and poor decisions. On the first drive, Bitikofer made a great throw on third-and-3 across his body for a first down. But the next play ended with a dropped interception. The drive sputtered out a play later thanks to a sack. Earle got three first downs thanks to accurate throws, but again the drive ended near midfield. Chiarolanzio started the third and final series with a great rollout and 19-yard completion, then he missed a wide open Sam Hildebrand for what would’ve been an easy 55 yard touchdown. The defense played with speed and aggression while the offense looked indecisive and apprehensive. But after all, it is April and a new offense will be working out the hiccups into the regular season. After a rocky start in the red-zone scrimmage, the offense began to pick up the pace. Ethan Torres nailed field goals of 31 and 19 yards on the first two drives, but Bitikofer got in the end zone on the third possession thanks to a six-yard touchdown pass to a crowded Renn Lints on third down. Chiarolanzio started the fourth and final drive with a 20-yard strike to Blair Herman on a post route and an extra point from Torres clinched the win for the offense. That momentum carried into the final situational segment of the night, the fourth-down scrimmage, which was 12 fourth down plays of varying yard lengths. The offense started with a bang when Earle went 62 yards on fourth-and-2 with a read option that fooled everybody. The offense won three of the next four plays, taking a 4-1 advantage, but the defense buckled down, got into the back field, defended some passes and created havoc as it earned seven straight stops and took the 8-4 win. On the night, the defense took two of the three competitive scrimmages.